Sodium caseinate is white to light yellow plates, particles and powders, odorless, tasteless or with slight peculiar fragrance and taste and easily soluble in water. The solution is neutral and will produce casein precipitation with the addition of acids. Sodium caseinate has favorable emulsification and stabilization functions as well as viscosity increasing, adhesive, foaming and foam stabilizing functions. Also, it is often used for strengthening proteins. Since it is a kind of water-soluble emulsifying agent, it has wide application. LDs50 400-500g/kg; FAO/WHO (1985) ruled that there is no limit on ADI. Besides, FDA also lists it as GRAS (generally recognized as safe), without toxicity. Sodium caseinate has strong hydrophilicity and thus wider application than casein. It can be used in meat, aquatic meat products, ice cream, biscuit, bread, noodles and other grain products. In sausage, it can be used to make fat distribution uniform, and enhance the adhesion property of meat. The dosage in sausage is 0.2%-0.3%. In the fish cake, it can improve the elasticity. In ice cream, the use of sodium caseinate helps to the bubble of products stable and to prevent sugar condensation and contraction. In bread it is used to achieve enhancement. In bread, biscuit and noodles, the dosage is 0.2%-0.5%; in foreign pastry, doughnut and chocolate, it is 0.59%-5.0% while in cream milk beverages, it is 0.2%-0.39%. In addition, gellan gum can also be used in dairy products and egg products. Sodium caseinate, also called casein sodium, sodium complexes, casein sodium salt, is mainly made from fresh milk by purification of casein, with the content of 2.5% in milk, via acid coagulation technique and then by alkaline sodium reaction. 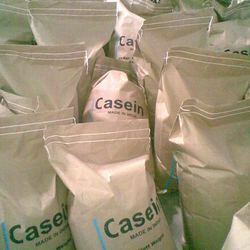 Casein is insoluble in water but sodium caseinate after reaction has superb water solubility. Sodium caseinate contains all kinds of essential amino-acids and a variety of microelements for the human body, so it can act as not only a nutritional supplement and protein source of various foods, but also the mineral microelement for the human body. Since it has good viscosity-increasing property as well as foaming and gas retention properties characteristic of protein, it can also be used as the emulsifying stabilizer and thickener and has favorable nutrition values. In the food industry, it has heat, fresh and fragrance preservation as well as quality improvement functions. As a food additive recommended by both FAO and WHO, sodium caseinate is widely used in meat products (such as luncheon meat, liver products, chicken, fish, sausage and ham, providing meat and fish products with high quality protein sources as well as superb emulsifying stability), baked food, fresh butter, butterine, salad dressing, coffee mate, baby food, cheese analogues, dessert, beverages, medicine, tobacco, cosmetics and household chemical industries. In the food industry, sodium caseinate can have emulsifying and thickening functions. Besides, since it has favorable emulsifying performance and strong binding force of fat and water, it is an ideal choice for processing enterprises of dairy products, creamer/non-dairy creamer, fresh butter, meat products, cold drinks and ice cream. 1. Directly mix sodium caseinate with other ingredients in proportion and then produce after the model. 2. Dissolve with other emulsifying agents in the meanwhile and then put into products. 3. Mix with oil together with heat and then put the ingredients. 4. Combine with sugar and then put into products after dissolution. 5. Add warm water to mix sodium caseinate into pastry and then put ingredients in required proportion. 6. According to the technological requirements for different products, take necessary steps.